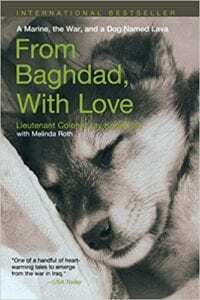 From Baghdad, With Love follows the adoption of an adorable yet mischievous puppy found in an abandoned house in Fallujah, Iraq. While on a search for insurgents, a group of Marines hear a suspicious scratching noise and prepare to shoot, when something stops them. Upon further investigation, they are startled to find a mangy, underfed puppy. Military law prohibits them from the keeping of pets by military personnel, but the men, known as the Lava Dogs, are unable to leave the dog behind. They transport the animal back to their compound where they lovingly care for the dog. The dog, nicknamed Lava after the unit, works his way into each and every Marine’s heart. Although he has a hardened exterior, Lieutenant Colonel Jay Kopelman, becomes particularly enamored by the destructive, yet lovable dog. Soon, he is obsessed with finding a way to bring the growing dog home to the United States. The book is a pleasant read, but could have benefited with some editing. The author switches from the past to the present in his story telling, making the story somewhat jarring. It also uses a conversational style of writing that does not always work. This might be the result of having two authors working on the text. Still, From Baghdad, With Love is a touching story that takes place in one of the most shattered countries on earth. The reader is taken to a land where a hapless, yet loving dog brings a reminder to war-weary soldiers of their faraway homes. It also reveals the horrors of war and the stupidity of some of the military’s rules when dealing with animals. I was touched by Kopelman’s emotions -- admitting to crying on several occasions when it looked like his beloved dog would not make it out of Iraq. A caution to parents: despite the cover picture of a cute, sleeping puppy, this is not a book meant for children. The language is pointed with frequent four-letter words. In addition, Kopelman describes how dogs caught on bases are sometimes shot, buried alive, or come to other horrible ends, as well as recounting his felt experience of watching stray dogs feed on the carcasses of dead Iraqis. For an adult, it brings the horrible realities of war to light, but for children it is too graphic. Quill says: Although the book needs some editing, it is still worth reading.